At long last, after weeks of waiting, we’re going to that great restaurant everyone’s been talking up. We’ve pinched pennies, we’ve cleared calendars, we’ve read the reviews online and the menu and strategized endlessly about how and what we’ll order. Only: this place doesn’t take reservations, so we’re showing up early and hoping for the best. Here comes the hostess now, she says she can seat us right away. We follow her past tiny tables, where pitying eyes peer at us over elongated menus, to an extended piece of wood surrounded by chairs and covered with half-finished plates and half-sipped glasses of wine that all reverberate with the noise of countless voices chattering at high speed. This, we soon learn, is the dreaded communal table and before we can express our willingness to wait for a two-top or a four-top or any top that’s not a communal-top, the hostess drops the menus and flees. Let me tell you something about communal tables. In theory, they’re new, they’re fresh, they’re exciting. They’re trendy! That’s what restaurants want you to think. But here’s a secret. Restaurants don’t have communal tables because they make the dining experience more pleasurable. They have communal tables because they make the restaurant more money by squeezing more people into a small space and turning those seats more quickly. A restaurateur I met while writing my cookbook basically said as much as he toured me around his restaurant. “We make so much money with this communal table,” he said, gesturing to a large slab in the middle of the room. The space was so tight and uncomfortable as we squeezed around it, I couldn’t imagine it packed at night. “That’s cool,” I said, while secretly vowing to sit at the bar, if I ever came here as a customer. I’m not trying to be a sourpuss, but I’m not a communal table fan. 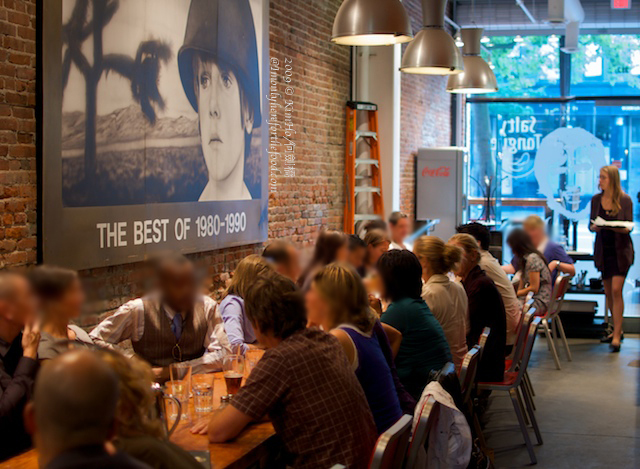 (Is anyone really a communal table fan?) I realize the word “communal” is an optimistic word and, at my most optimistic, I can imagine a scenario where a bunch of strangers sit at a communal table and pass baskets of bread, bottles of wine, and platters of oysters while sharing stories of life’s ups and downs, tales of adversity overcome. It’s a nice idea, much like communism was probably a nice idea, until it was put into practice. In practice, it doesn’t really work. Dinner at a communal table is a struggle. You’re vying for space, you’re vying for the server’s attention, you’re vying to be heard. If you’re sitting next to your dinner mate, chances are you have your back turned to the person sitting next to you, which is just awkward. If your dinner mate is sitting across from you, you’re probably leaning halfway across the table to make conversation. And if the people next to you are loud, you may find yourself backing down and just spending the night eavesdropping rather than fighting to be heard. There are restaurants where the food is positively dazzling but, because of a communal table, I’m not so eager to go back. It’s a phenomenon unique to a younger generation: a willingness to put up with an unpleasant dining situation in order to eat well. My parents (and I imagine your parents too) expect certain basics when they go out to dinner, basics that people my age and younger are willing to forego if it means getting to eat an uni brioche BLT or a powdered Caprese salad prepared by an avant-garde chef. All of that food is interesting and important but so, I’m starting to realize, is comfort. If I had to choose a ratio of food quality vs. comfort before dining out, it wouldn’t be 90 / 10 as some restaurants would have it. I would sacrifice some food quality in favor of enjoying myself during the eating process. Maybe 80 / 20? Or even 75 / 25? The point is, it shouldn’t have to be a choice. Ideally a restaurant should serve great food in a pleasant environment. And a pleasant environment does not, in my book, contain a communal table. Sure, they make the restaurant more money; sure, they keep wait times shorter; sure, they may occasionally cause people to connect who wouldn’t otherwise connect (though I’ve never seen that). The positives don’t outweigh the negatives. So, Mr. Gorbachev, tear down this communal table! We’ve had enough.